The Robert Morris University Student Fitness and Recreation Center is scheduled to open in August of 2017. The facility is slated to be over 40,000 square feet with two competition sized basketball/volleyball courts, a fitness center that includes free weights, selectorized strength equipment, cardio equipment, two group exercise studio spaces, a functional fitness room, locker rooms including a private single user shower and changing room, office suites for campus recreation staff, and an athletic wing that will be the eventual home to our NCAA Division I Men's and Women's Soccer and Women's Softball teams. The building will also include a patio space that will overlook our soccer game field. 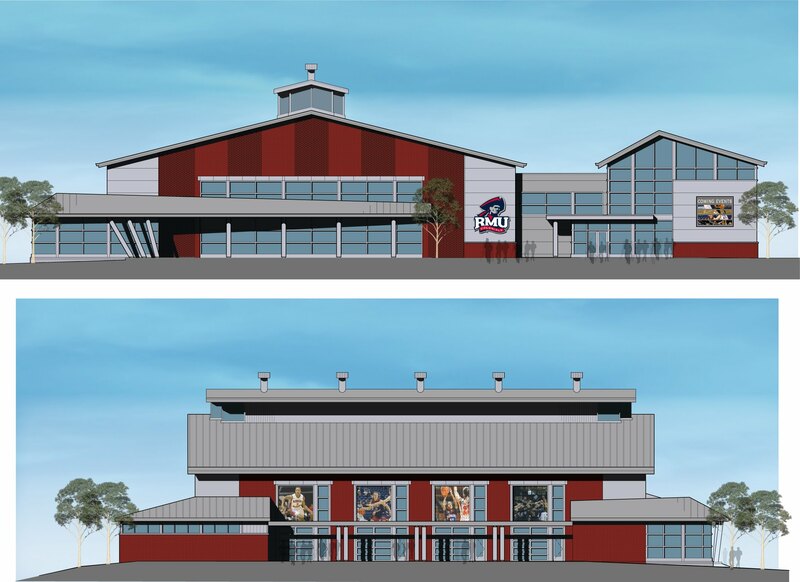 WHY DOES RMU NEED A NEW RECREATION AND FITNESS CENTER? A new recreation and fitness center contributes to an enhanced student and student-athlete experience. The significant enhancements of a modern facility will make for a better experience for the student body, and also for the faculty and staff. It will provide the exercise and training amenities that prospective students now expect when considering where to enroll. The main student exercise facility is now in Jefferson Center, which is more than 50 years old. Yorktown Hall also has exercise facilities, but they are not conveniently located for students on the main campus. As a university asset, the new recreation and fitness center will be a central place for our student body to engage in health and wellness activities and our indoor intramural sports. It will be fully equipped with all the amenities of a first-rate recreation and fitness center with approximately 40,000 square feet of programming and exercise space. The center will enhance the overall campus experience, a concern the university is constantly looking to address. HOW DOES THE RECREATION AND FITNESS CENTER FIT THE UNIVERSITY STRATEGIC PLANNING? 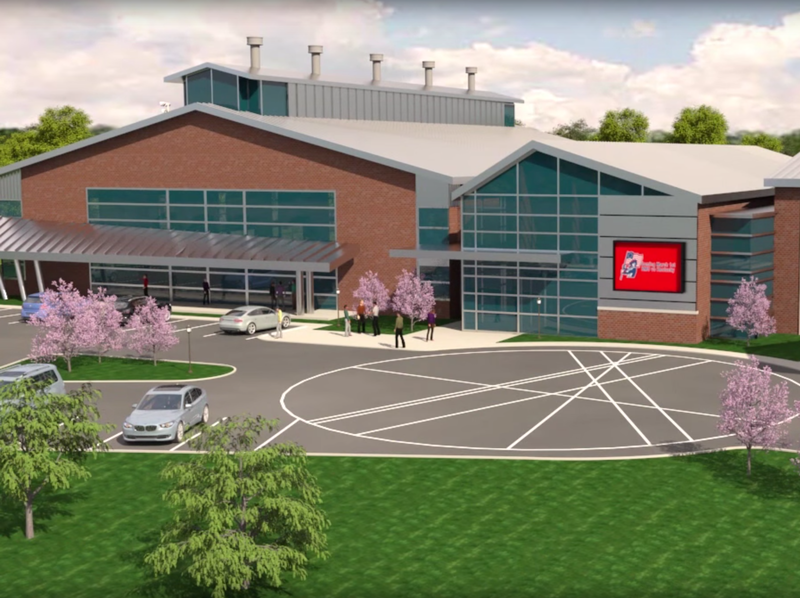 The recreation and fitness center is a priority of the RMU Board of Trustees. It is expected to significantly transform the campus community. WHERE IS THE LOCATION OF THE BUILDING? The center will be located on the current North Athletic Complex grounds. WHAT IS THE TOTAL CONSTRUCTION COST OF THE RECREATION AND FITNESS CENTER? $7 million, all raised from individual and corporate donors. The fitness center's construction is paid for by corporate and private donors and state development funding. The Student Government Association voted in 2016 to authorize a new per-student fee beginning in Fall 2017 to cover the center's annual operating budget. The fee is $125 per semester for full time traditional undergraduate students and $63 per semester for part-time undergraduates. Do students want a new center? A 2013 student survey conducted by the Student Government Association found strong support for building a new facility. In November 2016, SGA voted overwhelmingly in favor of formal plans for the center, as well as a plan to enact a new student fee to support its operations. WHAT IS THE RESIDUAL IMPACT OF THIS BUILDING, BOTH FOR STUDENT-ATHLETES AND THE OVERALL STUDENT BODY? Today’s consumers, which include students, expect a top-tier experience when they enroll at a university, and this recreation and fitness center will meet those needs. RMU attracts interest from students nationally and internationally for our academic reputation, quality of professional preparation, and the overall beauty of the campus. Building a recreation and fitness center that is state-of-the-art will make our campus even more attractive to the student body and future students. WILL THERE BE PARKING AT THE FACILITY? Yes, there will be parking next to the building.